Johnny Was embroidered multi colored print on light silver Silk. 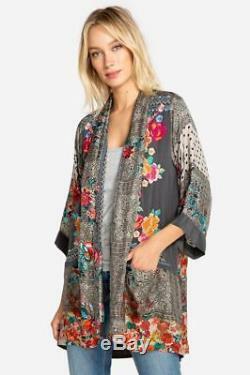 Open tie draped pockets Kimono Wrap size xl, l, m.
The Ellamo Embroidered Kimono is a perfect piece to accent any type of outfit with a celebration of colorful, natural aesthetic. 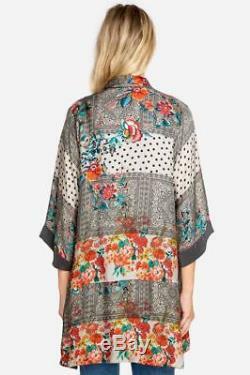 Around the hem of the kimono, there is a beautiful floral pattern that stands out from the rest of the patterned kimono. Perfect for any type of weather and temperature, the silky-smooth kimono will add a natural flair to any outfit and make it pop. 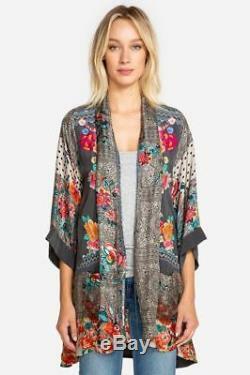 Because of the lightweight, silky material, this kimono will be a perfect accessory for any outfit without adding unnecessary weight, making it perfect to wear all year round. Product Details: · Silk Twill embroidered · Multicolored · Half Sleeve, front pockets and tie · Open Front with tie · Care Instructions: Dry Clean. Let me know what size you wear. Measurements: bit roomy because of draped cut could easily fit larger too. Xl bust 25 length rear center 34. The item "Johnny Was Samira frame Draped Kimono tie front Wrap multi color Silk M, L or xl" is in sale since Saturday, December 15, 2018. This item is in the category "Clothing, Shoes & Accessories\Women's Clothing\Sweaters". The seller is "lifestylethreads" and is located in Santa Monica, California.